If you are a fan of Twilight or just wondering what on Earth this vampire phenomenon is all about, than I would recommend that you check out this DVD from Sony. The DVD not only visits key locales of real the world of Twilight, it also gives the viewer an insightful look into the world of Twilight and more particularly, the real Forks where over 250,000 fans have made the pilgrimage. Apart from the interesting stories that are to be found along the way, the locations that are highlighted are quite amazing from the dark and mysterious forests, including the homes of Bella and Jacob to the other romantic destinations. Destination Forks: the Real World of Twilight is quite down to Earth and as opposed to alienating or making fun of the Twilight fans, it's actually quite interesting to be taken through the places these "pilgrims" have visited such as Bella Italia in Port Angeles and how this links to the story of Stephanie Meyer and the impact it made on fans.Add in interviews from Twilight fans and they give the viewer a fascinating snapshot into their lives that not only include their favourite characters but how Twilight fits into their life. 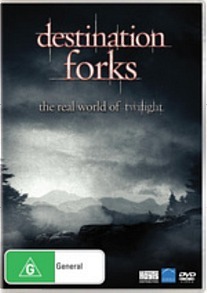 With above average video quality and decent audio, Destination Forks: the Real World of Twilight is definitely a must have for Twilight fans and those wanting to know what all the magic of Bella, Edward and co. is all about it.